A ring belonging to an 18th Century Indian ruler has been sold at an auction in London amid criticism from heritage groups. The jewelled golden ring was sold for £145,000 by Christie's auction house. It belonged to Tipu Sultan, a Muslim king, and is notable because it was inscribed with the name of a Hindu God. Tipu Sultan is best known for fighting against British rule in India. The ring is thought to have been taken from him by a British general as he lay dead. The 41.2g ring was sold to an undisclosed bidder for almost 10 times its estimated price at the auction in central London, according to Christie's website. It is inscribed with the name of the Hindu God Ram in raised Devanagri script. Some say this shows that the king was more sympathetic to Hindus than previously thought. The ring was allegedly taken from the slain body of Tipu Sultan at the end of the 1799 Srirangappattinam battle he fought against the British East India Company's forces. The auction listing noted that "it is surprising that a ring bearing the name of a Hindu god would have been worn by the great Muslim warrior". 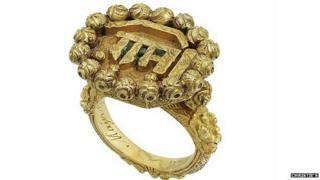 "It is perhaps more likely that the ring was taken from Tipu Sultan's collection," the listing said. Tipu Sultan was considered a progressive ruler, says Manivannan Thirumalai from the BBC's Tamil section. Also known as the Tiger of Mysore, he ruled the state for 17 years after he succeeded his father, Hyder Ali. Earlier this month Professor S. Settar from India's National Institute of Advanced Studies warned that the ring might be hidden from public view if it was sold to a private bidder. He urged the Indian government to "make use of all available avenues, legal and diplomatic, to recover the ring". If the ring could not be stopped from going to auction, he said, Indian philanthropists should be encouraged to purchase it on behalf of the nation. It is not known if the new owner of the ring is Indian. The ring was previously listed for sale by Christie's in 2012 but was then withdrawn from sale. #BBCtrending: Was India's Tipu Sultan a hero or a despot?